Zygor’s Guide Review, Is It Worth It? 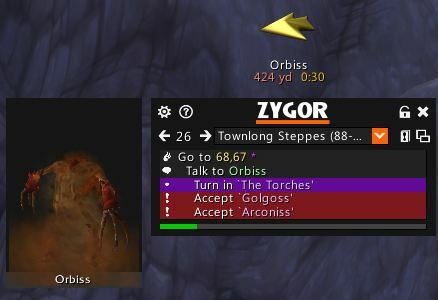 Zygor’s is (and always is) completely updated for all new patches, Legion and beyond. Grab it now and get to 110 ASAP. If you want to skip the review and head straight to Zygor’s page, click here now. If you buy the guide through the links on this page I do get a cut. It helps to keep this site running. With the guide I have leveled one Rogue from 70 to 91, another from 1-110 (yeah, two 90+ Rogues,) a pair of DKs from 55-110, a Mage and a Paladin from 1-110, and various others to various levels. Is Zygor’s Guide “Worth It?” Oh yes. I confess, I like this guide. We all do. 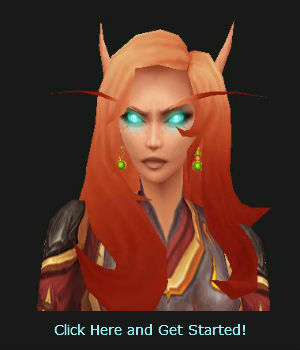 Back in those days a lot of leveling was done, not by questing, but by endless grinding of appropriate mobs. You’d smash a few hundred of this, level, and then go smash a few hundred of that. Sounds fascinating, doesn’t it? One of the big advantages to the guides was that you could avoid most grinding and use the questing system efficiently. Since then the XP requirements from one level to the other have been nerfed by a fair amount. 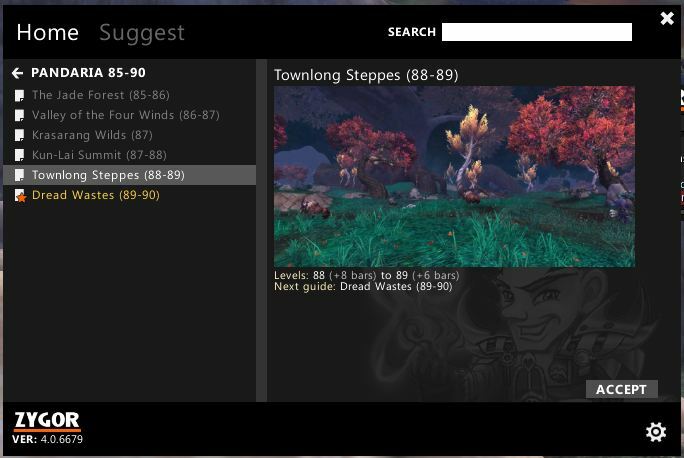 Then there’s the in-game quest helper, which track quests, shows, destinations, and so on. What it doesn’t show you is the best order to take them, which ones you can (or should) skip, and so on. And… it’s a bit glitchy, especially in Draenor. Not all the quest detail was included in the guides. This meant not only reading the guide, but also the quest log and the occasional link to some website. If you left the game you’d have to remember where you left off. John Cook has put this thing together and we think it’s pretty darn cool. Given the way this guide is put together, and assuming some fast and efficient leveling on our part (don’t take the scenic route, etc.) then I think that many of us will be able to hit 110 in just a few days. Others, more disciplined, will easily be faster. No more switching: The entire guide appears as a small, resizable window on your main screen. All the detail that you need to complete the quest is included. You’ll never have to switch back to a PDF, a website, or even the in-game main map to see where you have to go or what’s next. 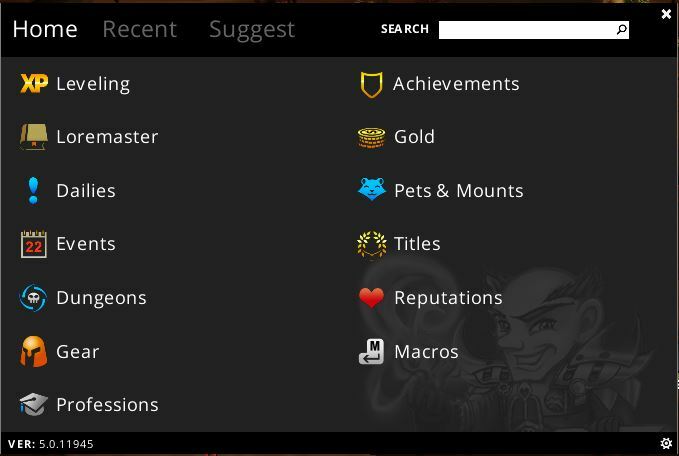 Here’s a shot of the in-game guide window. Note the detail and descriptions of the steps. The waypoint arrow can be moved anywhere on screen. Also, note the little guy to the left of the guide. That’s a pic of your target. If you don’t need it you can turn it off in the configuration options. The yellow arrow turns green when you’re facing the correct direction, I’m not doing that in this pic. If you are facing completely away then the arrow will be red. Just step through the menus, hit accept, and the guide will start up in the right place. By the way, this also works fine if you’re 95+ and in the new Draenor zones. 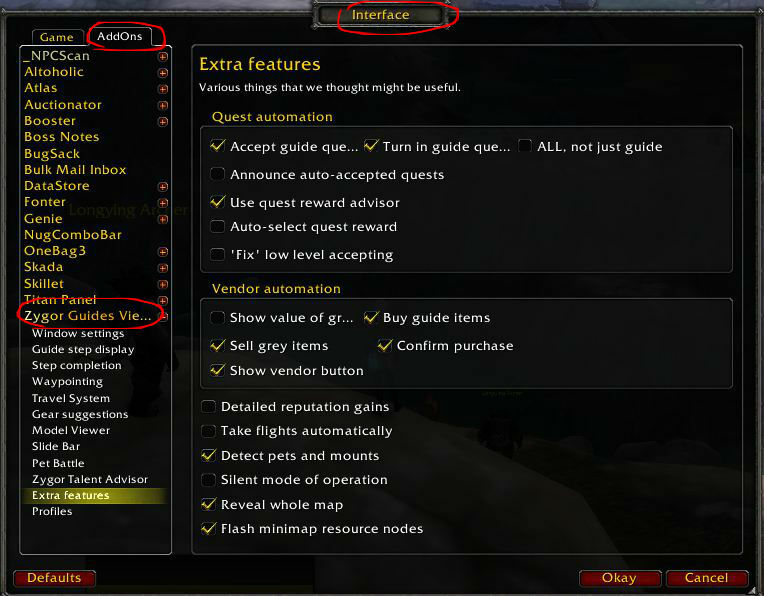 Warlords of Draenor introduced a new feature (Ok, a lot of features.) This one is that certain areas have “hidden” quests/objectives. You enter the area and the objective appears on your quest list. Completing it gives about five times the gold and XP of any regular quest. Zygor’s knows where these are and makes sure you hit them. The entire path of quests is visible in the guide window. You can scroll forward or back at anytime. Want to skip something? Use the right arrow or click the next quest in line and the previous quest is grayed out. Is the path faster than that of any other guide? I can’t really answer that, not having played through all of them to 90 or 110. We don’t see any need to try the others and you will certainly move at a very fast pace. You will never wonder about where to go and what to do next. Zygor‘s avoids the time wasting quests, as well. Overall, we’ve found it easy to use and we can just go boom, boom, boom through the quests. Very nice. No more having to visit various websites. Think of how much time that will save you. No more having to decide which quests to take and which to skip and how to best maximize your leveling speed. The guide will skip quests, sometimes several at a time, and will keep up with you. This is a pretty cool feature, in my opinion. Basically it notes exactly where you are at any given level and if it “sees” that you’re ready to move on it will prompt you. Automatic quest acceptance and hand-in. 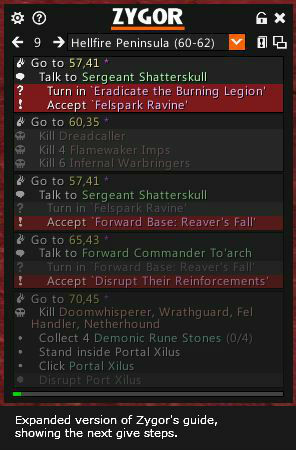 Click a quest-giver and any available quests will be automatically grabbed. If you need to hand any in then that’s taken care of, as well. It will not give you time to read any of the quests, but if you want ultimate speed, and already know the story or don’t care, then this is the way to go. Dungeons are covered, but you don’t need a guide for those. All the quest-givers are just inside the dungeon doors. Doing a lot of dungeons will put you ahead of the guide, but advancing to your new position in the guide is easy. There is a “gear selection” feature, which recommends the best gear of the available rewards. Sometimes we don’t agree with the suggestions, and so we leave it off. Feel free to use it if you like the suggestions. Yet One More Feature – The talent adviser. Not sure which talents you should use while leveling? Zygor will advise you. As you can see in the image all my picks were wrong, but I was poking around with some PvP. 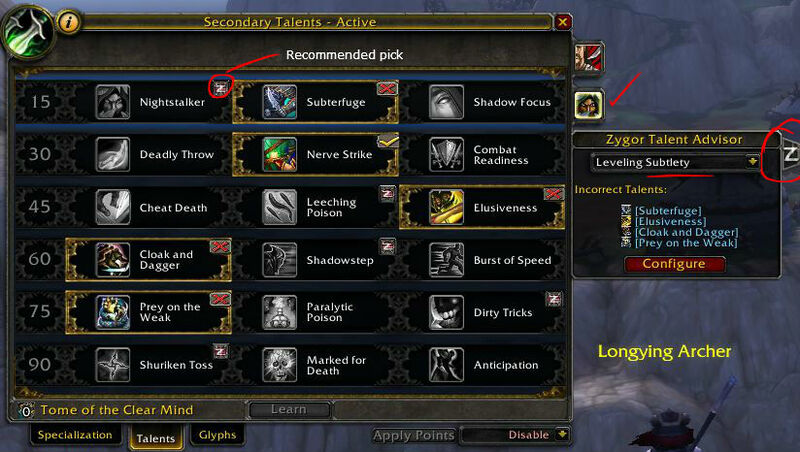 You’ll see a small “Z” by the recommended picks, including the level 90 one. If you are using the “dual build” feature it will advise you for either spec. Glyphs, too. The “Adviser” tab is that “Z” you see circled on the right. It will pop the configuration window out and then back in. It works exactly the same way for the level 110 talents. Zygor has a variety of guides available and all of them can be accessed from inside the man guide widget. Gold, profession, pet & mounts, and a lot more. Check it out.